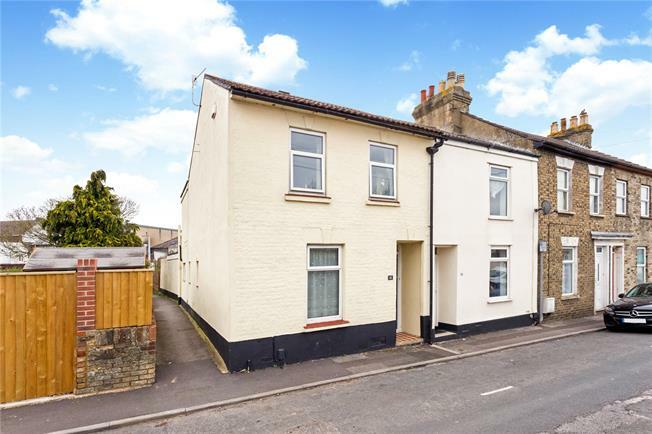 3 Bedroom Terraced House For Sale in Salisbury for Asking Price £225,000. An exciting opportunity to purchase this end of terrace period property situated in an enviable position within the city centre ring road. This lovely family home is ideal for first time buyers or as a buy to let investment and is within easy walking distance to all of the cities amenities, including the mainline railway station. The property has benefitted from a rear extension providing a good sized recently updated kitchen and modernised family bathroom. The ample ground floor living accommodation comprises of a deceptive open plan sitting/dining room, modern kitchen complete and a second reception room with a feature fireplace. The first floor accommodation comprises of three bedrooms, two generous doubles and spacious single. The rear of the property can be accessed through French doors from the sitting room/ dining room and has been predominantly paved with walled secure boundaries. The garden offers an excellent degree of privacy and is a generous size for a city centre home. An internal inspection is highly recommended to fully appreciate the many benefits of this superb home. Vendors suited. Within a level walk are all of Salisbury's excellent facilities - shopping, leisure, cultural and educational and within a few minutes walk of Salisbury's mainline station with trains to London Waterloo (journey time approximately 86 minutes), as well as a twice weekly market. Good local schools are numerous and include Salisbury Cathedral School, Chafyn Grove, Godolphin School, as well as Bishop Wordsworth and South Wilts Grammar Schools. There is racing at Salisbury and Wincanton, golf at Highpost, South Wilts and Rushmore. Fishing on the River Avon and other nearby chalk streams. The countryside surrounding Salisbury offers large unspoiled areas, ideal for walking and riding. The A303 provides access to the south west and London via the M3.